It was my turn to choose a favorite TechnoKids technology project this month. After lots of waffling, I finally settled on TechnoQuestionnaire, a technology project with Google Forms lessons ideal for Grades 6-12. It was very difficult for me to pick only one. I love each technology project that TechnoKids publishes for different reasons. For example, I like the creative spark that ignites when students complete TechnoToon. The graphic stories always look fantastic when they are finished. TechnoToon is a top selling TechnoKids project, but it is not my top pick. Another technology project that I love is TechnoBudget. The shopping spree concept is something that engages students. The activities make spreadsheets easy to understand and fun to use. TechnoBudget is a favorite of many teachers, but it is still not my top pick. Why pick TechnoQuestionnaire? The quick answer is I love how Google Forms can be used to create meaningful learning experiences. I wish more teachers used Google Forms in their curriculum. Discover how Google Forms can be integrated into curriculum. I know that many teachers are reluctant to use Google Forms, but it is one of my favorite web-based apps from Google. I like how easy it is to gather information. The variety of question types allows students to gather a range of information. In addition, the automatically generated report clearly summarizes the survey results. I like Google Forms so much that I designed a second technology project, TechnoTrivia, for elementary teachers. One of the things I like the most about TechnoQuestionnaire is that it uses a real-world problem-solving model. 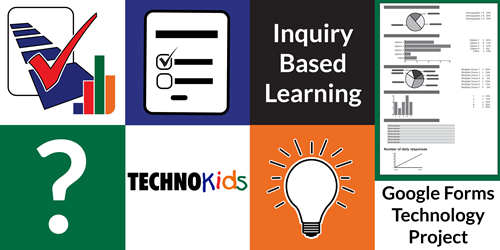 The technology project applies an inquiry-based approach to learning. In the lessons, students learn how to select a research question and design a questionnaire to collect data. Afterwards, they explore data analysis techniques to interpret the findings. TechnoQuestionnaire has activities that offer a practical use of technology. The skills that students learn can be transferred to new situations. I remember being part of the curriculum development team in charge of designing TechnoQuestionnaire a few years ago. In the beginning, I worked with several classes of Grade 7 and 8 students. I had two goals. I wanted students to understand the practical application of Google Forms. I also wanted to design a series of activities that middle and high school students would find interesting. I didn’t want them to be bored. Instead, I wanted them to appreciate the power of Google Forms and understand how they could use it in real life. It was fascinating to watch students become researchers. When the unit came to an end, the curriculum development team created TechnoQuestionnaire. I like all the things that make it unique. I like the school spirit survey activity because it provides a concrete example of the purpose of a survey. I like the presentation of findings at the end of the project because it gives students an audience bigger than their teacher. I also like the pivot chart extension activity – because I like pivot charts. TechnoQuestionnaire is a technology project best suited for middle and high school studnts. Check out my top pick! Did you know you can create quizzes using Google Forms that automatically calculate a score and report results? You can! 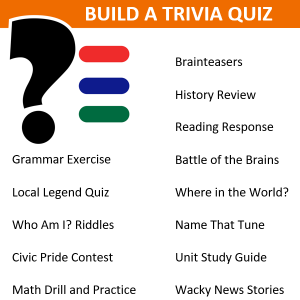 Aside from making your own quizzes to test student knowledge, you can have students build their own trivia quizzes. Google Forms Quizzes is a feature that transforms any form into a quiz that includes a point value, answer key, and scoring system. 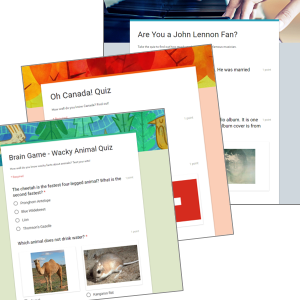 Making a quiz offers a fun way for students to develop critical thinking, improve information recall, and enhance communication skills. The theme of the trivia can be about a unit of study or based upon personal interest. Integrate the Quiz feature in Google Forms into language arts, mathematics, social studies, geography, history, science, art, music, health, or business studies. Spelling Bee: Expand vocabulary. Host a competition that has participants identify the definition, find the misspelled word, or spell a term correctly. Reading Response: Form a connection to text. Respond to a novel or short story. Design a quiz that has readers match a character to a statement, describe the setting, or determine the significance of an event. Grammar Exercise: Practice grammar skills. Create an activity that challenges classmates to punctuate a sentence, recognize parts of speech, or pick the correct homonym. Pick Your Own Ending Story: Transform the quiz feature into a short story that has readers pick what happens next. The decision affects the ending. Drill and Practice: Master basic addition, subtraction, multiplication, or division facts. Produce a simple worksheet that has quiz takers choose the correct answer or complete an equation. Brainteaser: Boost reasoning. Construct a brainteaser with word problems or puzzles that test a person’s wit. Unit Study Guide: Prepare for an upcoming test. Develop a study tool that focuses on the meaning of keywords, recall of essential facts, and the importance of key concepts. Wacky New Stories: Explore current events. 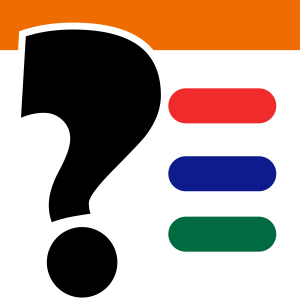 Questions include sensational headlines with information about the news story. Quiz takers must determine if they are true or false. Civic Pride Contest: Celebrate your country. Invent questions that has fellow citizens label capital cities, finish the national anthem, or select famous places. Where in the World? Showcase a place. Use map outlines, flags, tourist attractions, and tidbits of information to explore the importance of a location. Local Legend Quiz: Appreciate your hometown. Invite community members to answer trivia about local sports teams, current events, sites, or personalities. Who am I? Riddles: Acknowledge significant people and their contributions. Generate riddles using famous quotes, photos, or achievements to provide clues to their identity. Historical Timeline: Determine the importance of events. Invent a quiz that has history buffs identify dates, sequence events, and pinpoint the cause or effect of an incident. Research Review: Gain a deeper understanding of scientific concepts. Create a review to help fellow classmates recall experimental steps, results, and meaning of findings. Art Crawl: Appreciate art. Design a gallery walk that includes questions about famous painters, paintings, and techniques. Name that Tune: Host a music tournament. Test competitors’ ability to select the correct song line, title, or artist. Fun Fitness Facts: Challenge fitness fanatics. Ask questions about building strength, muscle anatomy, or improving skills. Business Marketing: Many companies use quizzes to connect with customers. For example, a gym might post a quiz about health on their blog or a travel agency about a destination on their website. Pretend to be a business owner. Design a quiz related to a product or service. Battle of the Brains: Design a trivia game that collects the name and email address of participants. Analyze results to declare a winner. Trivia Game: Collaborate to invent a game to entertain your friends. Select team members with unique areas of knowledge. Divide quiz into categories using sections. Each team member creates questions for their specific category based on their specialized expertise. Do you want to learn how to build a quiz? TechnoTrivia is a project developed by TechnoKids Inc. that includes step-by-step instructions. 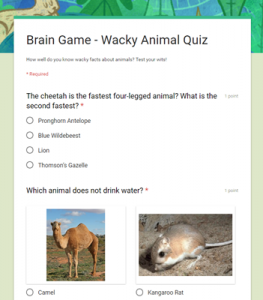 Activities have students formulate questions, create an answer key, and customize quiz settings. Learn more about TechnoTrivia. When kids enjoy math and are engaged, they learn skills more effectively. Finding a project where students are both having fun and building proficiency in mathematics is a bonus. The newest release by TechnoKids Inc., TechnoCandy, fits the bill perfectly! In this technology project, elementary and middle school students acquire math skills as they learn about spreadsheets. In TechnoCandy, students develop a plan to boost candy sales. They investigate a problem by conducting a survey and researching candy packaging. A spreadsheet is used to organize, calculate, and graph data. Based on the evidence, students recommend a solution in a written report. The practical, real world nature of the problem appeals to children. When they understand the connection between math skills and their applications, mathematics becomes interesting and relevant. Helping a candy company to improve their marketing strategies is sure to be an appealing challenge. 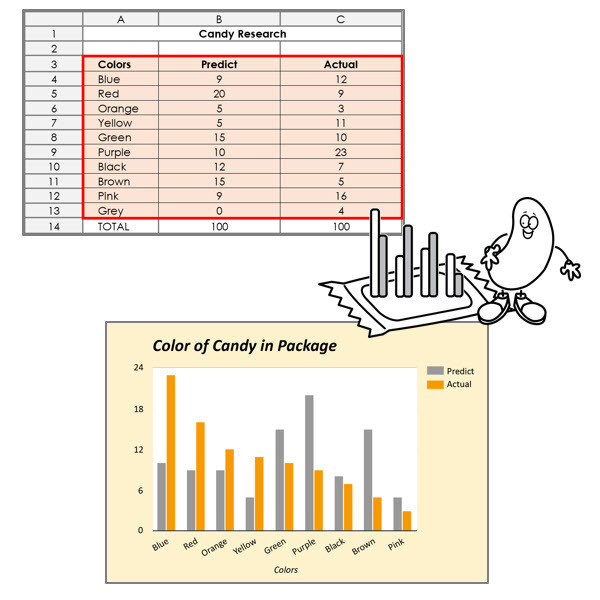 The problem solving activities in TechnoCandy make use of templates. In this way, students spend no time setting up spreadsheets, but rather focus on interpreting data and devising a solution. Use Google Sheets, Google Docs, Google Slides, AND Google Forms! 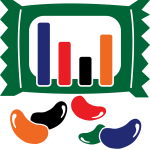 The TechnoCandy technology project, with its many optional activities, builds skills using many Google Apps tools. Students create pie and line graphs using Google Sheets, write a solution using Google Docs, design a candy package using Google Slides, and conduct a survey using Google Forms.